I just bought my first Macbook today (long time Windows user) but I am running into issues loading in the .OVA of Rapid 7's "Hackazon" vulnerable web app into VirtualBox and getting a bridged connection so that I can scan it and connect to it. I know there are lots of these questions that have been posted about networking with VMs in other forms, but I have followed all of the suggestions from a dozen pages and nothing seems to work, and I would really like to not regret buying this machine. Since this is a brand new machine, are there any Mac permissions networking configurations that I should be aware of? Am I missing something dumb? This generally worked when I used VMs in the past on Windows. Huh--strange! So it turns out that it was something with that particular .ova file. I just downloaded Ubuntu and it was able to bridge no problem. I guess that's something that I need to report to Rapid7. Not the answer you're looking for? 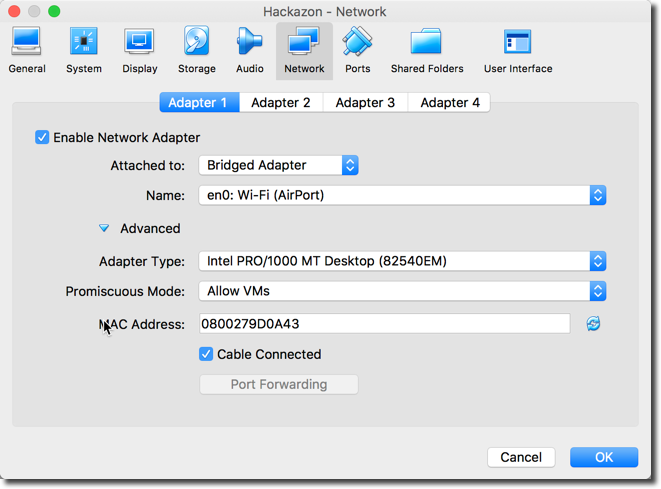 Browse other questions tagged network high-sierra virtualization virtualbox .